The residence of Jean-Luc Matha is located in the center of Bruéjouls, a quaint village at the bottom of the Aveyron valley. Matha is a man in his mid-forties, with a thick moustache, laughing eyes and, more often than not, a cigarette in hand. He once studied to be a priest and a clown, before giving up both professions and returning to the earth. Jean-Luc began with six hectares of vines. Now he works a vineyard that contains 13, with vines that average 30 years. From these comes the fruit that comprises one of Marcillac's best wines. "Vines are like man," he says with a mischievous smile. "When they are young, they are like children. They're not strong enough to support weight. As they get older, it's as if they gain muscles. They begin to control the weight." Jean-Luc was one of the first in the Marcillac appellation to trim leaves and excess grapes from his vines, something he's confident produces more concentrated juice. Once picked, all grapes are destemmed in an effort to avoid hard, green tannin. Now, most producers in the area have followed his lead. Two wines made at the property are 100% Mansois. The Cuvée Lairis is fermented in stainless steel for 10-12 days and sees no oak. The Cuvée Peirafi has a fermentation period that takes place over 15-20 days before going into very old foudres. "To use new wood," Jean-Luc says, "one must have grapes that provide a certain material. Mansois does not do that. Instead, we've simply turned our attention to achieving extreme concentration on the vine and in tank, which will ultimately help our wine to age gracefully. "I love the things that the earth gives," he continues. "I love working with the vine up on the hill. And just before I come down, I like to watch the sunset and see how the colors change. I breathe and listen to the sounds around me. I am in the midst of nature and feel completely content." 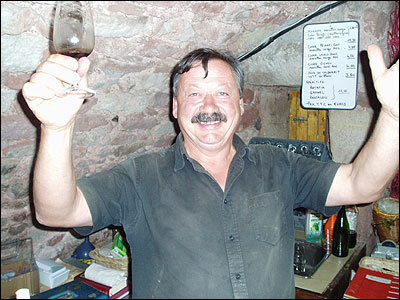 "So far I have made fourteen wines at this property," says Jean-Luc. "And in a way, they are like my fourteen children. Each one is a little bit different, yet each one has a common bond that gives them their ultimate identity: the earth, the vine, the frost, the rain and the sun. That, for me, is the beauty of winemaking." Tasting Notes: Deep ruby. Intriguing aromas include cassis, white pepper, and paprika. Medium to full-body. Supple, suave texture. Like a hypothetical blend of Cabernet Franc from the Loire, Gamay from Beaujolais, and Grenache from the Rhône. Highly fruity mouth with well-integrated tannin on the finish.